We have been connecting visitors with hotels in the Algarve for a long time now ... but there is a lot more to travel than simply booking a hotel room. Our scope now extends to include Flights, Car Hire and all those Travel Extras that you need to organise for your trip. Designed for convenience, simplicity and value, we invite you to use this site as the starting point for your journey. Whatever you want to do and wherever you want to stay, either in the Town, the Countryside or by the Beach, we hope you will be able to find it all right here. The Algarve is a cosmopolitan region crammed with chic beach resorts and stylish holiday accommodation yet where the rural areas still offer an unadulterated natural beauty and a pace of life relatively unaffected by the changes of the past century. The History of the Algarve dates back around 4000 years ago when the first settlers established the towns of Lagoa, Lagos and Tavira. The Romans came during the First and Second Centuries but it was the Moors who probably had the most impact on the region from the 8th century when they ruled over the area from their capital in Silves. 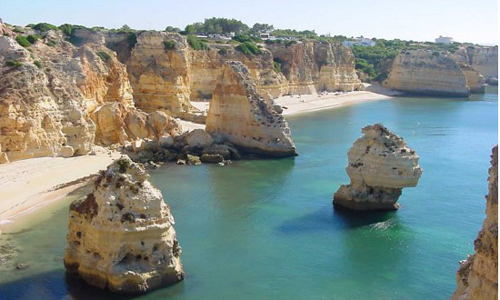 In fact the name "Algarve" is derived from the Arabic "Al Gharb" meaning "The West". Much of the architecture you see today is based on the Moorish traditions and it wasn't until 1249 that they were finally defeated and the region became part of the Kingdom of Portugal. Modern day Algarve has benefited enormously from Portugal's membership in the EU and funding has been used to develop the road network including the A22 motorway that stretches from Lagos in the west to Vila Real de Santo Antonio in the east and the Guadiana river bridge that links Portugal and Spain. Situated on Portugal's southern coast, the Algarve is blessed with the perfect holiday climate. Summer temperatures regularly reach over 30 degrees and the average daytime temperature during the winter is around 14 degrees. It is a golfers' paradise, where the mild, sunny days of winter provide a welcome escape from the cold, wet and often unplayable courses of Northern Europe. But the Algarve is not just about Golf. There is something for everyone including watersports, horseriding, sightseeing, fishing, hunting, shopping, theme parks and a record number of EEC "Blue Flag" beaches. Come and see for yourself ... and bring your Lonely Planet Guide with you!